Aetna customers will be able to walk in to clinics in CVS stores for less expensive medical services. 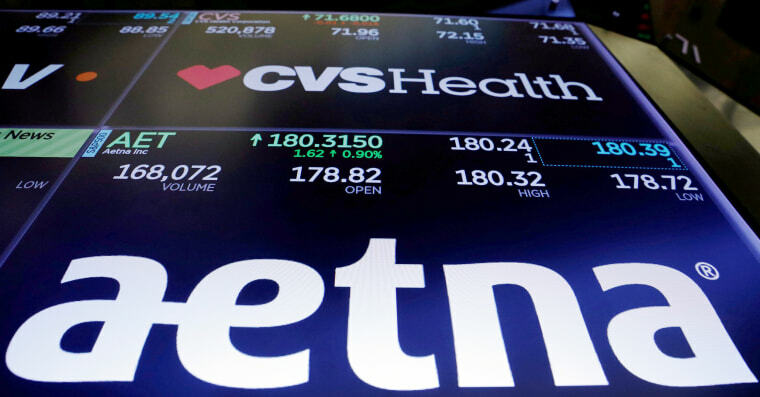 Pharmacy chain CVS Health has won antitrust approval for its $69 billion acquisition of health insurer Aetna, the Justice Department said on Wednesday, paving the way for a combination with potential to cut health care costs for consumers. It is the second large recent health care deal to win U.S. Justice Department approval. The agency gave the green light to health insurer Cigna's $52 billion acquisition of the nation's largest pharmacy benefit manager, Express Scripts, last month. The decision comes as the Trump administration intensifies pressure on health care industry "middlemen," such as PBMs, over practices it says increase the cost of prescription medicines for U.S. consumers. Shares of CVS and Aetna each rose about 1 percent on Wednesday, a day when the broader market was sharply lower. The deal was approved on the condition that the companies sell Aetna's standalone Medicare prescription drug plan business, known as Medicare Part D, the Justice Department said. Aetna last month said it would sell all of those standalone plans for prescription drugs that are part of the Medicare program for Americans aged 65 and older and the disabled to WellCare Health Plans Inc, paving the way for the deal's approval. Without the sale the two companies would have owned more than a 30 percent share of those standalone Medicare drug plans, creating concern about the amount of control the new CVS would have had over this part of the Medicare insurance market. Drugs administered by doctors and hospitals are covered under a separate Medicare benefit. Together Aetna and CVS have 6.8 million members in standalone Medicare drug plans, the Justice Department said. CVS also has a large PBM business. "The divestitures required here allow for the creation of an integrated pharmacy and health benefits company that has the potential to generate benefits by improving the quality and lowering the costs of the health care services that American consumers can obtain," Makan Delrahim, head of the department's Antitrust Division, said in a statement. CVS first announced plans to buy Aetna last December. Since then, Amazon has stepped in to the health care market with the purchase of online pharmacy PillPack, which Wall Street analysts say can help it expand further in health care and undercut major players across the prescription drugs supply chain. CVS Chief Executive Larry Merlo said in a statement that the deal is on track to close early in the fourth quarter.